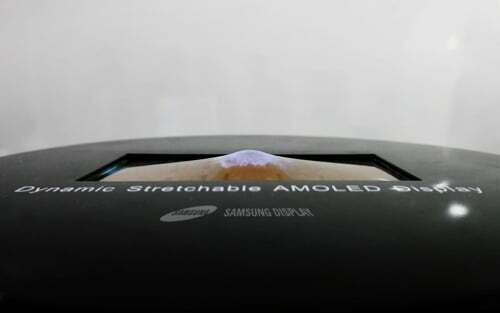 Samsung’s display-making affiliate, Samsung Display, announced today that it’s going to showcase the world’s first “stretchable” display at the Society for Information Display 2017 in Los Angeles this week. SID 2017 runs from Tuesday to Thursday. Samsung points out that the stretchable OLED display is unique as it can bend in both directions. It’s different from the flexible panels that we’ve seen from the company previously, they could only bend in one direction. Industry experts are of the view that stretchable OLED displays call for more advanced technology compared to other display types in the market and can thus be considered the best product in flexible technology. Samsung says that its stretchable OLED display can stretch by as much as 12 millimeters when pressure without losing a high degree of resolution. It’s going to showcase 9.1-inch versions of this display. Practical applications for this technology include Internet of Things devices. Attendees at the Society for Information Display 2017 in Los Angeles will be able to check out Samsung’s latest display technology in person. Even though it’s demonstrating the technology now, it’s unclear when it will be ready for practical applications. So we may have to wait a while before devices with Samsung’s stretchable OLED display hit the market.